My first actual Christmas experience ever that wasn’t blended with my family’s apathy for the holiday was when I got my first Christmas stocking ever. It was from my high school boyfriend’s mom, and honestly it was such a big deal to me. I had never had a stocking before, and it was so exciting to have someone think of giving me one. It was filled with chocolate, a mini teddy bear, and if I remember correctly, a mini ceramic cat? Chris is really big on Christmas, and I’m curious as to what our Christmas traditions will be.Â Will we have a Christmas tree? I don’t want a real one because even though it smells nice, it’s not sustainable and it just gets thrown out by the end of the season. I definitely want stockings. Will he dress up like Santa? Will we let our kids believe in Santa? I never believed in Santa, I was a very logic-based kid who asked too many questions about Santa. So I don’t know how to ingrain that magical belief in my kids. Will we host Christmas dinner? Probably not, nobody wants a vegan Christmas but me. I don’t really want meat all up in my kitchen. What will our Christmas mornings be like? I feel like these are questions I should be asking Chris. How have I not asked him these questions before? 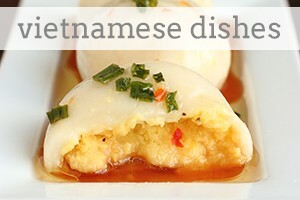 In my last post, I talked about Vietnamese traditions in culture, and it seems appropriate today to share something more aligned with Canadian traditions in culture. What says Canadian more than potatoes, butter and salt? Crispy potatoes, fluffy insides, salty buttery inside and out…if that’s not the epitome of North American traditions for comfort food, I don’t know what is. 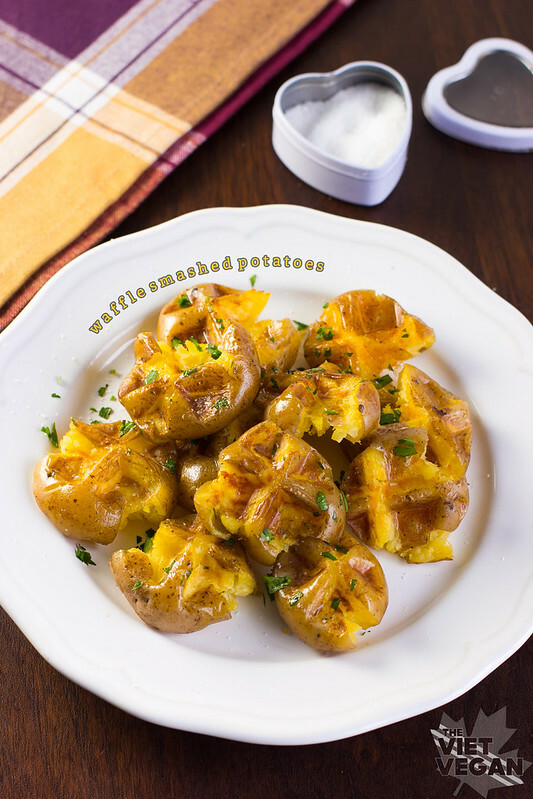 Thus, I bring you waffle smashed potatoes, because everything is better when you make it in an waffle iron, right? 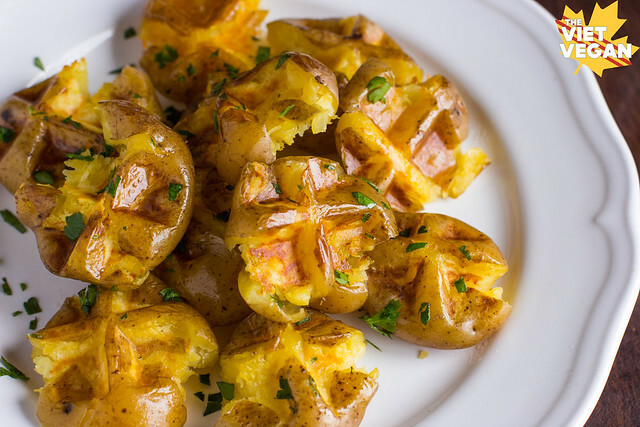 It’s like smashed potatoes, but better because they’re faster, you don’t need to turn on the oven, and the amount of crispy surface area is maximized. You need new potatoes or “baby” potatoes. I tried them with heirloom potatoes, but my favourite potatoes to use are yellow ones. They’re perfectly fluffy and crisp up so nicely. Their buttery flavour and crispy edges make them perfect alongside anything you desire. They make for a great breakfast if you boil them the day before, pop them in the fridge and cook them up on the waffle iron in the morning. Easier than pan-fried and faster too. In a large pot, boil potatoes until fork-tender, about 10-15 minutes depending on the size. Once you can slide a knife or fork into a potato easily, it's ready. Drain and let steam dry. Use a silicone basting brush to lightly butter the waffle iron for extra crispiness. Arrange potatoes on the iron, about 1 new potato per 4 waffle "squares". Sprinkle some parsley on top, and firmly press down to "smash" the cooked potatoes. Let cook for about 3-5 minutes, checking until they have beautifully golden crisp. Remove from iron and sprinkle with salt to taste. Continue until all potatoes are done. 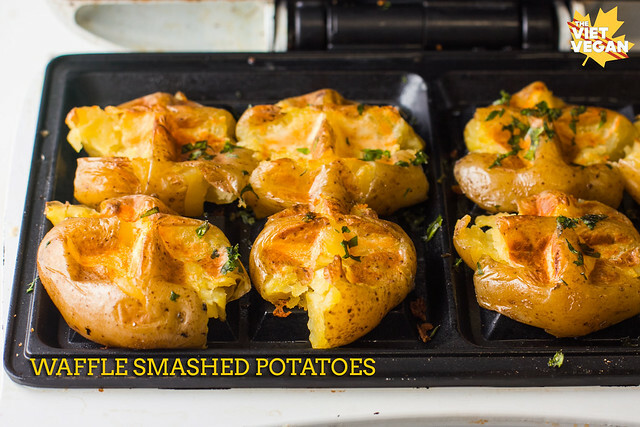 If you want to cut the cooking process, you can always boil a bunch of potatoes, store them in the fridge, and whenever you want piping hot crispy potatoes, pop them out of the fridge and waffle smash some potatoes! Hello new dinner for every night of the week. I found your site thru buzzfeed! I wanted to comment on the throwing out of christmas trees part ... I've had real trees for the majority of my memory, and while you're correct that you're cutting down a living tree, there are easy-to-find places (at least in my neighborhood) that will recycle it for you into mulch and ground coverings on trails. Just a little bonus! Hope you had a good holiday! I know I'm late for the waffled-food party, but mine comes in the mail today and I can't wait to try this recipe. We dug a few plants of regular white potatoes yesterday and I already have the golf-ball sized ones boiling to have this tonight (I'm gonna have to slather mine in country gravy, though!) The Christmas thing...I am a Christian. I don't celebrate Christmas. It gets a bit harder to resist when they get in school, but we manage. I was lucky to have twins in December a day before my hubby's b-day so rather than buying for everyone in the house except my oldest son, we have what we call 'celebration'. We all celebrate each other and Christ in the middle of the month b/c we want to. Then we do it again around his birthday in July. Works for us.